The War Poets Association promotes interest in the work, life and historical context of poets whose subject is the experience of war. It is interested in war poets of all periods and nationalities, with a primary focus on conflicts since 1914 – mainly the First World War, Spanish War 1936-39, Second World War and Ireland. There are already many societies dedicated to individual war poets; one of the WPA’s aims is to work with these and others to help promote joint activities and events of mutual interest. Chairman’s Letter, and WPA Subscription Renewals 2018 – 2019. I hope that you and your families have had a peaceful and very happy Christmas. At the end of October a WPA party of 50+ of us based ourselves in Arras and from there we followed the ‘final hundred days’ of the First World War and the remarkable series of victories of Field Marshal Haig’s army through to the conclusion and the Armistice on 11 November 1918. We read poetry and considered a number of First World War poets, in particular Edward Thomas, Isaac Rosenberg and Wilfred Owen. The World’s Worst Wound was our third and final tour commemorating the centenary of the Great War. Reports of our trips are elsewhere on this website. All of our visits were led by Andy Thompson and Jean Liddiard, to whom we owe very considerable thanks for their work for the WPA over these last four years. The centenary years have produced some remarkable ways of remembering and commemorating the First World War — The poppies in November 2014 in ‘The Blood Swept Land and Seas of Red’ creation in the moat of the Tower of London; and then four years later and also at the Tower, the Armistice centenary tribute ‘Beyond the Deepening Shadow 10,000 flames’; Danny Boyle’s extraordinary ‘Pages of the Sea’ commemorative event on 11th November 2018 with portraits of soldiers on 32 beaches including one of Wilfred Owen on Sunny Sands, Folkestone, Kent; and also shown on television on 11th November, Peter Jackson’s use of colourised archive footage in ‘They Shall Not Grow Old’, showing the First World War as it had not been seen before. And in these years our consideration of war poetry and the war poets has also been extended and now the works of women poets, Empire poets and non-combatant poets. This includes the poetry of ‘men and women who served at the Front, but not with a gun in their hand’ collected as ‘Poetry of Rescue in the First World War’ in Paul O’Prey’s recent anthology, Counter-Wave. Poetry of other dimensions is increasingly presented to us. The WPA will be involved in this. We plan, without forsaking support for the poets of the First World War, increasingly to look at other war poets. We suggested this in the last issue of our War Poetry Review with an article on Charles Causley and reviews of new books about Keith Douglas, Alun Lewis and Sidney Keyes. We will be hearing much more about and from them. In the Spring we will be having a meeting, probably in London, at which we will review what we have been doing and looking at what we will be doing. Details will be posted on the website once they are fixed. The annual WPA subscription for 2018-2019 fell due on 11th November 2018. We hope very much that you will now renew your subscription, if you haven’t already, and will continue to support the WPA. Details of how to do this and make a payment to WPA are on this website, here. For those in the UK, an online or electronic banking transfer to the WPA ‘s account with Lloyds Bank, account number 62819560, sort code 30-93-74 is probably the easiest method of payment. PayPal, via the website, here, is also possible and may be easier for some, especially those who live outside the UK. If you do make a ‘traditional’ bank transfer to Lloyds Bank from another country, please indicate that you will pay the bank charges. Alternatively, you can send a cheque in favour of the War Poets Association to me c/o Veale Wasbrough Vizards, Narrow Quay House, Narrow Quay, Bristol BS1 4QA, UK. The membership rates remain the same, as they have for a number of years: annual membership is £15.00 with concessions for students and seniors of £10; Life membership £150, concessions £100. You will find all the details here on this website. A number of members have moved and changed their address. To keep in touch, and also for those of you who prefer to receive the War Poetry Review by post, please confirm both your postal and your e-mail address. And if you have a current standing order in favour of WPA can you confirm this too? The WPA Committee is changing. I will be reporting on this and details will also be posted here on the website as they happen. And finally if you know anyone who might wish to join or who might be interested in the WPA do pass on the WPA’s details to them or put them in touch with us. New members and support are always very welcome. Article: A Pilgrimage of Remembrance, Writer and Daily Mail Columnist Bel Mooney Attends a Recent WPA Poetry Tour of Battlefields on the Western Front. 11 November 2018: Poet Laureate Carol Ann Duffy’s Poem for the centenary of the Armistice, The Wound In Time, read on beaches around Britain in an event directed by Danny Boyle. 27-30 October 2018: The World’s Worst Wound’: Eyewitness Tours Ltd & WPA Battlefields Tour. First World War 100: Poetry’s Passing Bells. Poet Daljit Nagra’s archive tribute on BBC iPlayer includes some letters to his mother and poems by Wilfred Owen, and Dennis Silk talking about Siegfried Sassoon. To commemorate the centenary of the end of the First World War, the WPA is providing free open access to the current issue and some back numbers of its journal, War Poetry Review, until the end of 2018. To access the journal, click on the link here or select ‘War Poetry Review’ from the top menu of this website. The password needed is 100centen4ry . 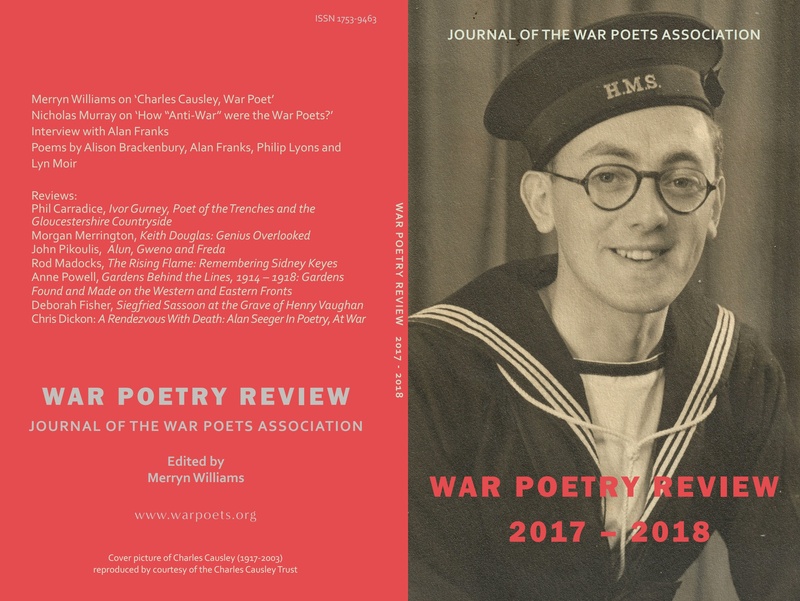 To join the War Poets Association and receive future printed issues of War Poetry Review or access them and the back issues online, click here. This latest issue of the journal was published in December 2017 and is available in print to members of the WPA. Please join the Association or renew your subscription to receive your printed copy. Click on the cover image here to read the list of contents. An online version is available via the password-controlled War Poetry Review page, here. Details about the journal and how to subscribe are also available on this page. If you have any feedback on this website, please do not hesitate to e-mail the WPA here or click on the ‘Contact Us’ tab above to send us a message.